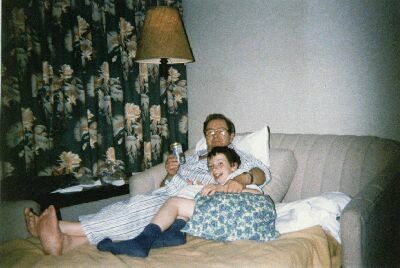 Jimmy, age ten, with his "Papa." My father and Jimmy were very close. They were buddies. They did a lot of things together, including batting practice. Jimmy got very good at it -- in my fathers words: "Too good." One day they were playing in my parent's backyard when Jimmy belted the ball right between my father's eyes. The ball hit the bridge of his glasses and broke them in two! Which led my father to the conclusion that Jimmy didn't need any more lessons!